La Famigilia Luxury Motor Yacht Cape Town. LA FAMIGLIA LUXURY YACHT CHARTER. 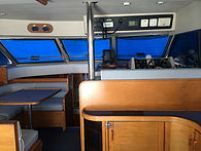 BOAT CHARTER CRUISES FROM CAPE TOWN. 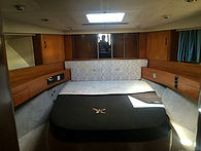 La Famiglia 55ft Luxury Motor Yacht. The 4-hour cruises include sailing around the famous Robben Island and then to Clifton. La Famiglia is licensed to carry 12 passengers. SAMSA certified. R10 000 for a 2 hour sunset cruise. R12 000 4 hr.Scenic cruise around Robben Island. R11 000 4 hr. Scenic cruise towards Hout Bay. R12 000 3 hr. Full Moon or Stargazer cruise. Choose from our Catering Section: Finger snacks and platters.... or bring your own snacks. No DJ facilities, you are welcome to bring your own CDs or USB. Functions, Special occasions. Team building. Atlantic Sunset Cruise, Hen and Bachelor Parties. La Famiglia 55ft Luxury Motor Yacht Charter.